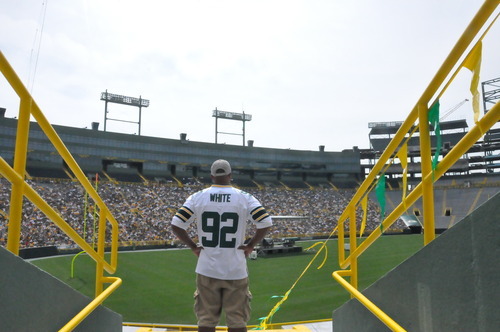 You can cross off Goal #7 (Green Bay Packers Shareholder Meeting) off my list. I was very fortunate to able to attend my first (of many) Green Bay Packers Shareholders meeting. The Packers really make you feel like family. I was surrounded by 16,000 people who were the nicest, most caring strangers I’ve ever met. The meeting informed all owners the financial state of the team as well as personnel moves. I know Lyssa doesn’t want to hear this but I hope to attend this meeting every single year. It makes me so proud to know that I am a part of such a historic franchise. I am an owner! Out of all of my goals..this one means the most to me.